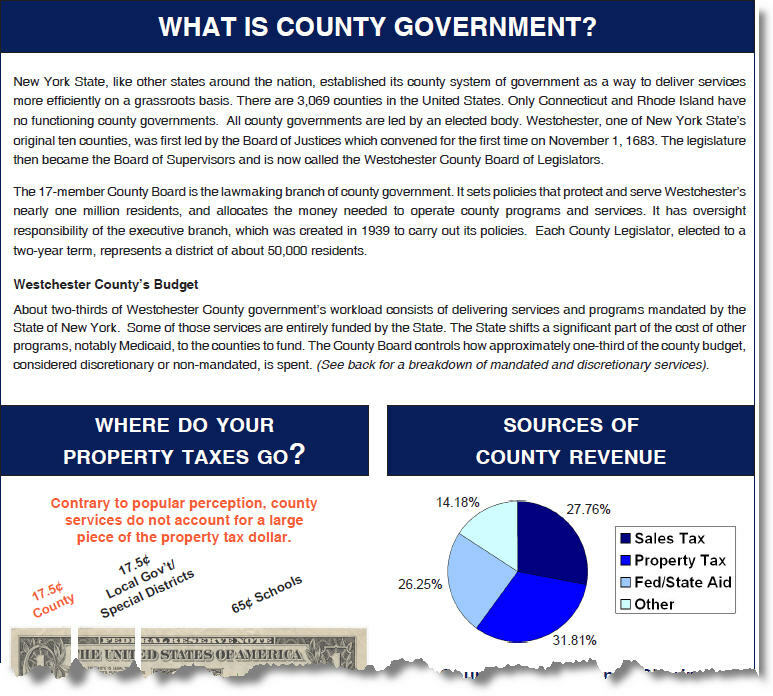 The seventeen-member Westchester County Board of Legislators is the legislative, policy-making branch of county government that has been in operation, in one form or another, for over 300 years! * It is to Westchester what the US Congress is to the United States. Each legislator is elected for a two-year term and represents a district of approximately 54,000 residents. A legislator must reside in the district he or she represents. Unlike the US Congress that is bicameral or has two chambers composed of the House of Representatives and the Senate, Westchester legislature is unicameral, having only one legislative body or chamber. The County Board meets at least once a month, usually on Monday evenings in the legislative chambers located on the 8th floor of the Michaelian Office Building. All Board meetings are open to the public. The powers of the County Board of Legislators are enumerated in the County’s charter. A key power of the Board concerns finances: appropriating funds, approving the budget and levying taxes. It also approves appointments by the County Executive and passes local laws, acts and resolutions, all requiring nine votes for passage except for bond acts that require twelve. Laws and acts are then sent to the County Executive for his signature or his disapproval. A veto by the County Executive can be overridden by a two-thirds vote of the Board. To read more about the Board's 300 year old history, go to the history section on this website. The Board of Legislators operates under a committee system. Currently, there are 13 committees, each of which is charged with overseeing a particular policy area. For example, if the matter involves a bond act, it will need to be reviewed and signed out by the Committee on Budget & Appropriations before the full Board can vote on it. The Chair of the Board appoints each committee’s membership as well as its chair. Every Legislator serves on at least one of the committees. Committee Meetings are very important to understanding and developing an issue before it comes to a full Board meeting for a vote. Any proposal, concern or letter from a citizen first goes to the full Board for referral to the appropriate committee. This committee may then study an issue and invite interested parties and experts to provide information and answer questions. Often officials of County Departments attend meetings to help the Legislators deal with the many complex issues. Committee members work in cooperation with the County Departments to solve problems and improve life in Westchester County. This is the same concept as is followed at the federal and state level. A proposed law approved by the legislative branch goes to the executive branch (the County Executive) to be signed. Within ten days, the County Executive either signs the legislation into law or returns it to the Legislature with a written explanation of the reasons for the “veto.” If the County Executive does not act within 10 days, the proposal automatically becomes a law. A vetoed proposal may still become a law. The Legislature can vote again on the proposal and “override the veto” by a two-thirds vote in favor. Ideas for new laws and changes to old laws come from many sources – from citizens, from legislators or from the executive branch. But only legislators or the county executive can sponsor a law. Consideration of a proposed law or change to a law begins when the item is placed on the Board of Legislators’ agenda and is referred to the appropriate committee or committees. For example, a proposal from the county executive that money be spent to purchase land for a park would be referred to the Parks, Planning, and Economic Development Committee as well as the Budget and Appropriations Committee. These committees then meet to examine the proposal. At these committee meetings, which are public, legislators would discuss the benefits and the costs of the proposal, they would listen to and question the county executive’s staff and the county commissioner of parks, they also would hear from members of the public. Every proposed law also is reviewed by the county law department and may be rewritten to address concerns expressed in the committee meetings. WRITE A LETTER to your Legislator to share your ideas and concerns. This is one of the many ways that Legislators find out what people want government to do. Who knows, maybe one of your ideas will become a law or lead to a new County policy. ATTEND MEETINGS of the Legislature which are held every other Monday night at 7 pm. Visit our website or call (914) 995-2800 to check meeting dates and agendas. You can also attend committee meetings which are usually on Mondays or Tuesdays during the day. EXPRESS YOUR OPINIONS to the Board of Legislators at the Public Hearing held during the first 30 minutes of each Board meeting. You should arrive a few minutes early and sign up for one of the 3 minute time slots.